When old ladies were younger, they used to make fancy parky [parka] or fancy boots. This fancy parka for a man—sewn in miniature for practice of perhaps to fit a large doll—is made of caribou fawn skin with wolverine trim. The mittens are attached by a string, to wear around the neck. Theresa Nanouk: Suami miksruuraġłui guuq piliuqpatine? Anna Etageak: Maybe just to sew. Theresa Nanouk: To practice sewing? Oscar Koutchak: Iŋilgaan taimanasinik atuguuruŋa. Theresa Nanouk: There were some in Unalakleet too? Anna Etageak: Yes, long ago. When old ladies were younger, they used to make fancy parky [parka] or fancy boots. Oscar Koutchak: Similar to that [curved hem] that goes around. Aron Crowell: So this Iñupiaq style was used in Unalakleet. Oscar Koutchak: The last one I ever saw was similar to that one there [women’s fur parka]. My sister Anita—she was born in 1926—she was wearing these during WWII. We fled from Unalakleet thinking about the Japanese. And she used to use this kind of parka to go to the Traeger store uniagaqłuni Aŋuagaq [by dog team with Aŋuagaq]. Anna Etageak: They use to go by dog team to conferences, to other villages, and they used to wear parkas like that. Anna Etageak: The edge is wolverine. I don’t know what kind of skins these [parka body] are. Frances Charles: I think it’s a fawn skin. Oscar Koutchak: Maybe caribou fawn skin. Anna Etageak: Yes, must be fawn skin. This one [fur trim] and that one [fur trim] are wolverine. This must be wolf [ruff]. Aron Crowell: What about the white parts? Anna Etageak: You know reindeer have white [hair]. Oscar Koutchak: Lots of reindeer have that white. Anna Etageak: When it’s thick, they cut it and use it for white [trim]. Suzi Jones: Is that skin dyed with alder bark? Aron Crowell: Are people making parkas in Unalakleet now? Oscar Koutchak: Mm-hmm. But not as fancy as that. Theresa Nanouk: And they start using lamb skin. Oscar Koutchak: But some people still have these squirrel skin parkas, made real fancy. Of course they have this calf skin on the bottom, real fancy work. And long tassels like that all over made out of wolverine. Aron Crowell: So the women who are making those parkas now, how did they learn? Oscar Koutchak: They learn from their mother. Suzi Jones: Anna, have you sewn fur parkas? Anna Etageak: Yes, I make them. Theresa Nanouk: She started to make them with lamb skin. Anna Etageak: When I used to go squirrel hunting, I used to make parkys out of mountain squirrel. Suzi Jones: And did you sew with sinew? Theresa Nanouk: She used to make sinew. Anna Etageak: I start using dental floss, or they started make real good skin thread. 1. This was discussed with a woman’s style parka E007587. The atigi or parka (a word of western Siberian-Russian origin) is a hooded, loose-fitting garment worn by both men and women. New and traditional designs are still made in Northwest Alaska today. 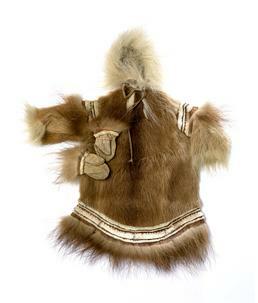 This mid-19th century miniature version of a man’s parka (with mittens) is made of caribou fawn skin, with wolverine trim and decorative bands of white caribou or reindeer fur. Historically, parkas were sewn from a variety of pelts—caribou or reindeer, ground squirrel, muskrat, marmot, mink, fox, mountain sheep and lynx, as well as from bird skins with the feathers left on. (1) Prior to the introduction of reindeer on the Seward Peninsula in 1892, Iñupiaq people traded across Bering Strait with Siberian Chukchi herders for white or spotted reindeer skin, which was used for making fancy parkas. (2) North coast Iñupiat traded with interior villages for caribou hides, as well as other animal skins such as wolf, wolverine, mountain sheep and fox. (3) Caribou and reindeer were often taken in the summer when the skins weighed less and the hair was finer and shorter. In very cold weather, two parkas were worn. The inner one would be of bird skins or animal pelts with the hair turned inward, while the outer one would be made of pelts with the hair side out. (8) In summer, people wore light-weight parkas or older, worn-out ones with the fur facing to the outside. (9) Waterproof hooded parkas made from seal intestines or fish skin were put on as a top layer to protect against rain or driving snow. (10) When cloth became available from Western traders, people began wearing cotton outer parkas to protect their fur garments from snow. (11) They took care to shake or beat the snow from an unprotected fur parka before entering a warm house, using a long, flattened piece of ivory, bone or antler. This prevented the fur from becoming wet, which over time would cause the hair to fall out. Men and boys wore belts around their parkas, often made from a wolverine skin with its feet, tail and sometimes head still attached.